Home favourite Marianne Vos easily won the road race world title to become only the second woman to complete an Olympic/World double in the same year. The Dutchwoman ended a run of five consecutive second places as she won the 129km eight-lap race around Limburg in three hours, 14 minutes, 29 seconds. Vos coasted home 10 seconds ahead of Australia's Rachel Neylan with Italy's Elisa Longo Borghini third. Emma Pooley was the best-placed Briton, almost five minutes down in 15th place. Pooley, who won team time trial bronze last Sunday, looked comfortable for most of the race, riding on the front of the main bunch and helping close down repeated attacks from Dutch, German and American riders. However, she had no answer when Vos made her move on the sixth of eight ascents of the Cauberg hill. Pooley told BBC Sport: "I didn't do a good enough job. I had good support from the [British] girls and I knew Vos was going to jump across and I didn't have the jump to go with her and once I had missed it I couldn't chase it back. 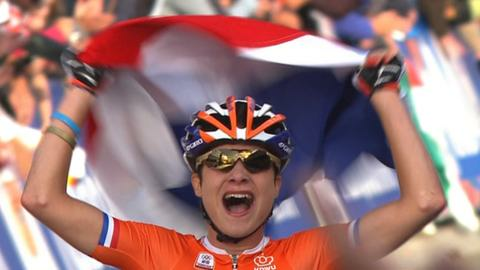 "We were predicting a bunch sprint but thanks to Marianne Vos, they were coming in one-by-one. It was like a mountain stage. She is a joy to watch when she is at the top of her game like that. Riders like that don't come along too often." "It was my job to go with her. I was a disappointment and I let the team down. "Days like today don't fill me with encouragement and I have been disappointing all year." Vos, 25, sprinted clear of the peloton and set off in pursuit of a group of five riders who had broken clear a lap earlier. She easily caught the leaders, which included her team-mate Anna van der Breggen, and attempted to break clear again one lap later on the penultimate climb of the 1,200m-long Cauberg but her efforts were marshalled by Neylan. The leading group rode the final lap together before Neylan attempted to break clear on the Cauberg but Vos zipped past her and maintained her lead over the final 800m from the top of the hill to the finish. Vos told BBC Sport: "I knew it could be the decisive break and it was great to see the gap growing from one, to two and then to three minutes. When we got to the last lap I thought this is the moment when I could be world champion. Britain's Nicole Cooke was the only other female rider to do the Olympic/World double when she triumphed in 2008 but she finished 60th this time around, more than five minutes down. Team-mate Sharon Laws was 39th with only 80 riders out of 132 starters completing the course. Britain's Katie Colclough was one of those who did not finish. She was caught up in a huge crash on the second ascent of the Cauberg, although it is unclear as to whether that played a part in her abandoning the race. 2. Rachel Neylan (Aus) +10"
3. Elisa Longo Borghini (Ita) +18"
4. Amber Neben (US) +33"
5. Anna van der Breggen (Ned) +55"
15. Emma Pooley (GB) + 4'37"